Bryce Harper is very adept at creating cryptic messages. Sometimes it feels like he has mastered the art of trolling. 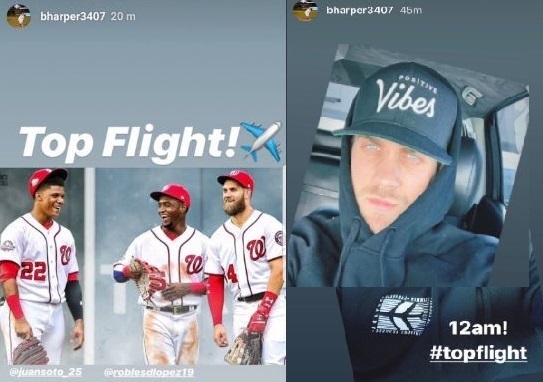 A few months ago, he tweeted out a photo that Juan Soto Instagram’d with the hashtag “TopFlight” and a few hours ago Bryce Instagram’d out #topflight with 12am! Can you decipher that? There are several teams “in” on Harper with Vegas betting 1:1 odds on Harper landing in San Francisco or is that Scottsdale where the Giants play their Spring Training? The Hot Stove season is technically over since Spring Training has started. But lots of Free Agents, including Bryce Harper, have not signed yet. So the question is . . . . .
. . . . . where does Bryce sign? This is not where you hope he signs. It is where you think he signs. Don’t be biased by the Vegas odds. Those are about getting folks to make losing bets. The afternoon buzz centered on a tweet from Chris Russell of 106.7 “The Fan” Radio in Washington, D.C. His sources told him Harper would be signed by Valentine’s Day on Thursday. This could be quite the divergence from reports we have heard for the last few months that Harper would not sign until Manny Machado signs. Is Machado close to signing or is Harper going to take matters into his own hands and sign his deal. This entry was posted in Feature, Harper. Bookmark the permalink.